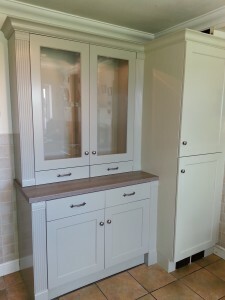 Hand Painted Schreiber Kitchen Northamptonshire, this was a 10 year old walnut wood finish kitchen that the customer wanted to update, she contacted me through the Traditional Painter web site. 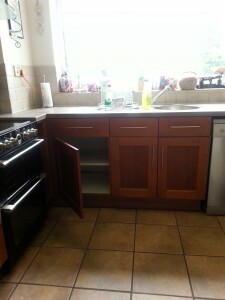 The first job was to clean down and degrease the furniture, i then removed the doors, drawers & plinths which i like to take back to my workshop to prepare and paint, this causes a lot less disruption for the customer and i am only on site for a couple of days on a average size kitchen to prepare and paint the remaining areas of the furniture. 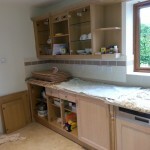 The customer decided she would have new worktops supplied and fitted, this work was carried out by Parker Kitchens of Towcester Northants a small family run business who i have worked with for many years and who i would highly recommend for any work required in Kitchens, Bedrooms & Bathrooms they offer a complete services from plan to installation. 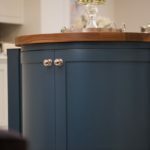 The furniture was painted in Parkers Almond and Parkers Stone to the dresser unit, the colours where matched in feelings furniture paint supplied by Holman Paints of Swindon who offer a colour matching service in any colour pattlet in the market place. The customer also decided to have new handles fitted these where also supplied by Parker Kitchens and fitted by me, i advised the customer that pewter effect handles would work very well with a hand paint finish. This is always a great advantage to hand paint a wood finish kitchen as you can make good to the old holes from the handles and re drill and re position the new handles. 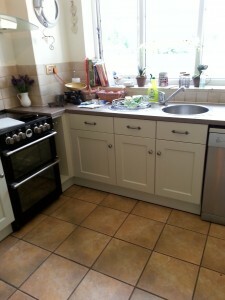 Paul has recently painted my kitchen doors, surrounds and fitted new handles , the whole experience of of dealing with Paul is fantastic, he is thoroughly dependable, honest and his work is outstanding . Paul happily provided samples and guided me in choosing the right handles and finish on the doors. 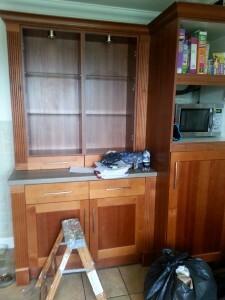 I am over- whelmed by the finish on my kitchen – it is stunning. 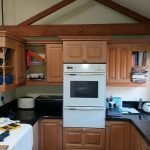 He is a real craftsman who takes immense pride in the quality of his work and it shows!- I cannot recommend him highly enough and i would not hesitate to encourage anyone thinking of having this type of work done to use Paul.